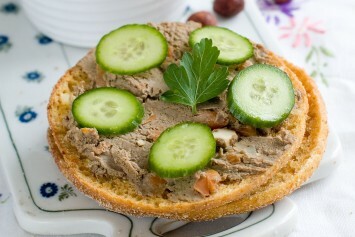 Chopped liver is a traditional Jewish recipe that the rest of the world has grown to love. My understanding is that it is one of the traditional passover recipes. Someone please correct me if I am wrong. This may not be the recipe for real liver haters, but for the rest of us, it’s certainly a good one. Broil the liver to medium doneness or sauté in oil on both sides. Cool the liver completely. Brown the onions in a bit of hot oil. You can process the liver mixture in one of two ways. 1. Grind the liver, eggs and fried onions in a meat grinder. 2. Process the liver in a food processor until minced. Add the remaining ingredients and process until blended. Add the seasonings. You can add a bit chicken broth if needed to reach the desired texture. Serve on crackers, crispbreads or toasted bagels. Great topped with thinly sliced cucumbers as in the image above. The old fashioned way to make chopped liver is to finely chop all of the ingredients together. Of course, nowadays we have fancy electric appliances for everything – thank goodness, or many of us wouldn’t make much. The texture of the dish is different depending on how you process the ingredients. Traditional chopped liver would obviously be more chunky. When you use the food grinder, it has a smoother consistency. Using the food processor make the consistency more like a pate. Traditionally chopped liver is made from schmaltz instead of oil. 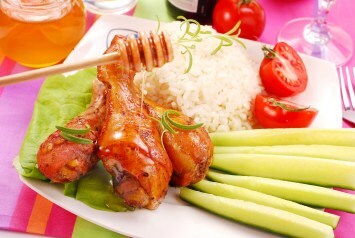 Schmaltz is rendered chicken fat, which is not always easy to find. Those in the know say it is still the best, so if you are a die hard foodie, you may want to seek it out and try it. Chicken livers may be substituted for the beef liver. Chopped liver is gluten free, a low carb recipe and a great diabetic recipe, so it suits many special diets. It can be difficult to find good appetizer recipes for special diets sometimes, so this one is welcome. Make some latkes to go with your chopped liver.